This product is a bundle (set of multiple products). This vanity set belongs to the xena series. 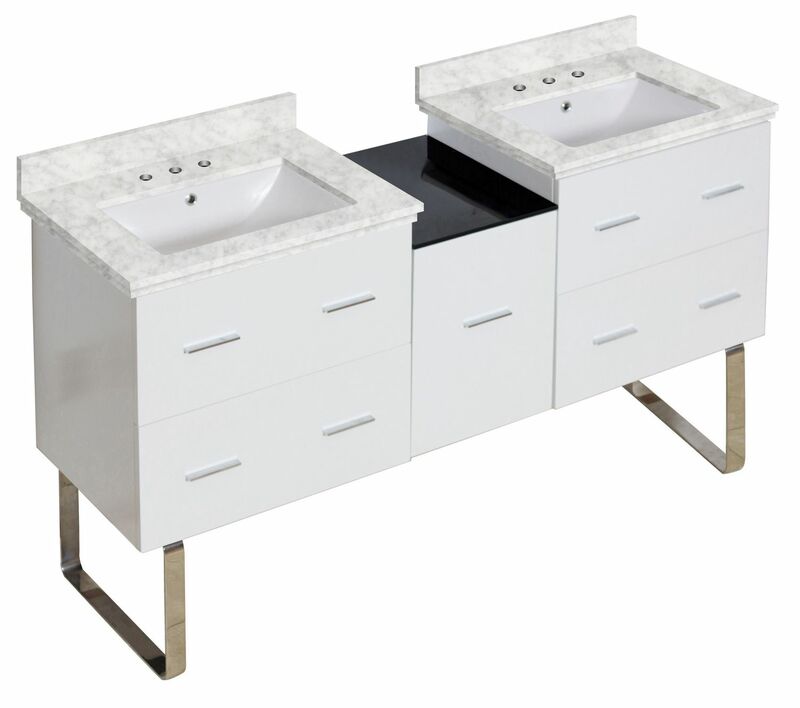 This vanity set features a rectangle shape with a modern style. This product is made for floor mount installation. DIY installation instructions are included in the box. This vanity set is designed for a 3h8-in. faucet and the faucet drilling location is on the left-right. Comes with an overflow for safety. This vanity set features 2 sinks. This vanity set features 5 drawers. The color of the undermount sink is white. This vanity set is made with plywood-melamine. The primary color of this product is white and it comes with chrome hardware. Smooth non-porous surface; prevents from discoloration and fading. Double fired and glazed for durability and stain resistance. 1.75-in. standard USA-Canada drain opening. Sink cut-out included in the box. It is highly recommended that you wait for the sink to physically arrive before proceeding with any cut-outs. No MDF or chipboard used. Cabinet hardware included. Completely finished from all sides including back and inside. 61.5-in. Width (left to right). 18.25-in. Depth (back to front). 34.5-in. Height (top to bottom). All dimensions are nominal. This product can usually be shipped out in 1-5 day. Quality control approved in Canada. Your order is physically inspected before shipping. Lookout for the inspectors seal. THIS PRODUCT INCLUDE(S): 2x units of undermount sink in white color (324), 1x glass top in black color (551), 2x units of marble top in bianca carara color (671), 1x miscellaneous part in chrome color (542), 2x units of vanity base in white color (541), 1x modular drawer in white color (549).